During my time in Korea, quality western food items were in short supply, but that is not to say that they were impossible to find. I had a brief encounter with a taperia in Incheon that supposedly had great tapas but left me wanting. I’ve lived in Spain, and this place omitted basic tapas that you would find on any menu in Spain or even in the USA. Then with the tapas that they did have, they couldn’t even do them properly like gambas a la plancha or tortilla espanola. So, when I landed in London, I was certain that they would at least have the know-how and mettle to pull off a decent tapateo due to the influx of Spanish immigrants or at the very least through geographical proximity to la patria compared to Korea. I was also meeting up with my friend, Rebecca, who I had met back in 2008 in Manchester, and she also had a taste for Spanish food. 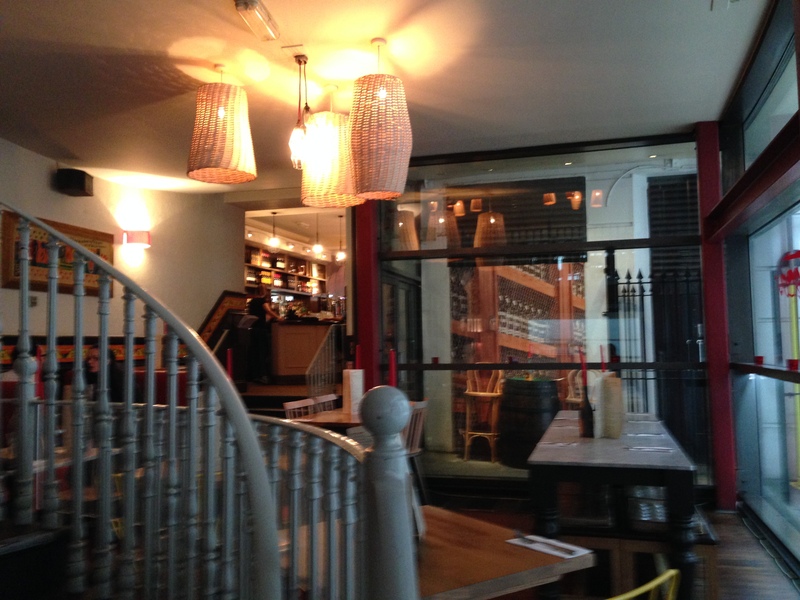 After a bit of wandering around the Covent Garden area, we finally found what we were looking for: La Tasca. Rebecca told me she had heard good things about it, so we went inside to see what all the hubbub was about. The decor was filled with plenty of cultural items from the peninsula that were not too tacky, and it was surprisingly empty for the height of lunchtime. Oh well, more room for us. The menu had an extensive offering of tapas of all varieties, cocidos, paellas, and meatless options for you vegetarians out there. As for drinks, they obviously had an extensive wine menu along with many different types of beers I sampled throughout Spain. While Rebecca went for more of the seafood options, I went more the land animal route with croquetas de pollo (chicken croquettes, a Madrid favorite, L 4.70), mejillas de puerco (pork cheeks, L 5.25), and patatas bravas (fried potatoes with spicy sauce, L 3.35). After a bit of catching up with an old friend, our tapas came out. 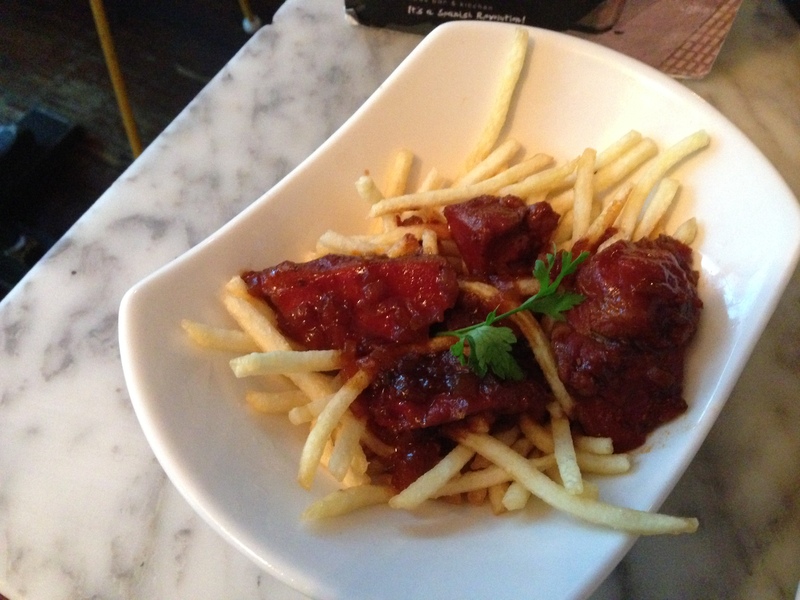 I began with the pork cheeks that were in a semi-sweet chili sauce nestled in a nest of fries. I was greatly satisfied as the sweet sauce combined with the saltiness of the fries to further enhance the tender morsels of pork. 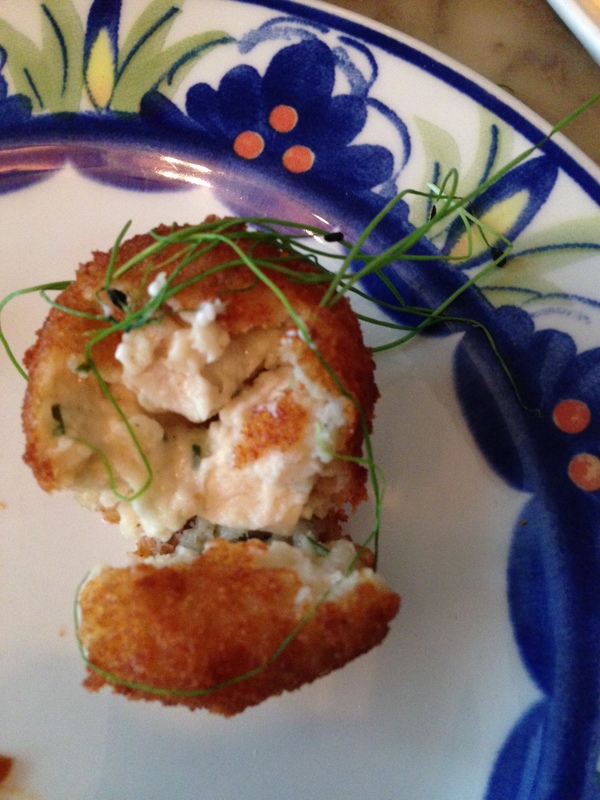 I moved on to the croquetas which were half-heartily presented on tufts of what seemed to be a garlic mayonnaise and garnished with sprigs of clover on top. Thankfully the presentation did not foreshadow the taste as I found them to have a crunchy, light exterior that gave way to a piping hot interior flush with pieces of all white chicken and melted manchego cheese. 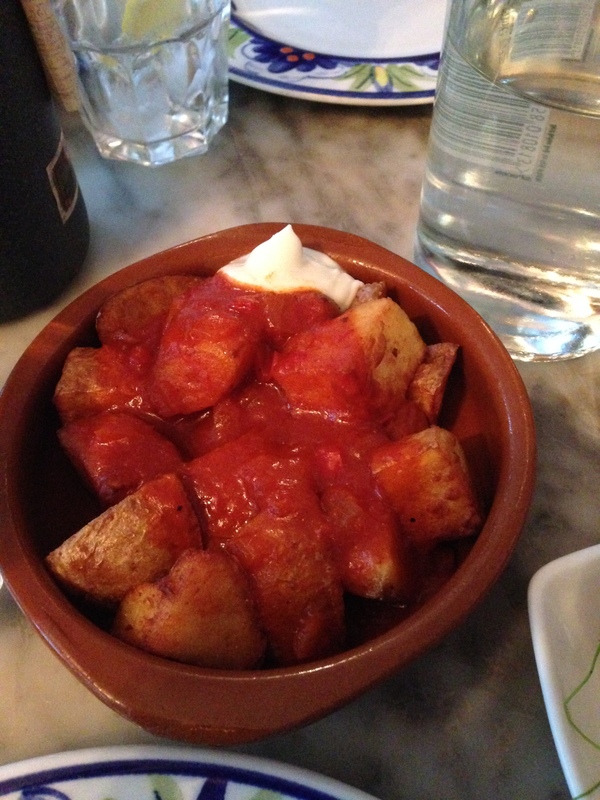 I saved my very favorite for last, the patatas bravas. This specific tapa is always my personal barometer of how true a tapas restaurant is to the real article in Spain, and while they did an adequate job at La Tasca, I’ve yet to find a restaurant outside of Spain that can recreate the sauce they use. 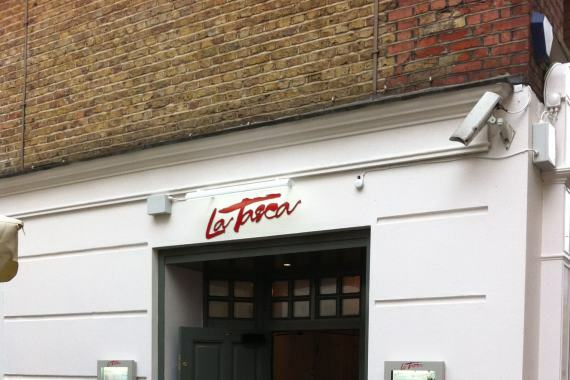 However, the ones at La Tasca were semi-satisfying in the sense that they had the peppery spice that comes with the dish, but the ratio of mayo to tomato sauce was completely off. 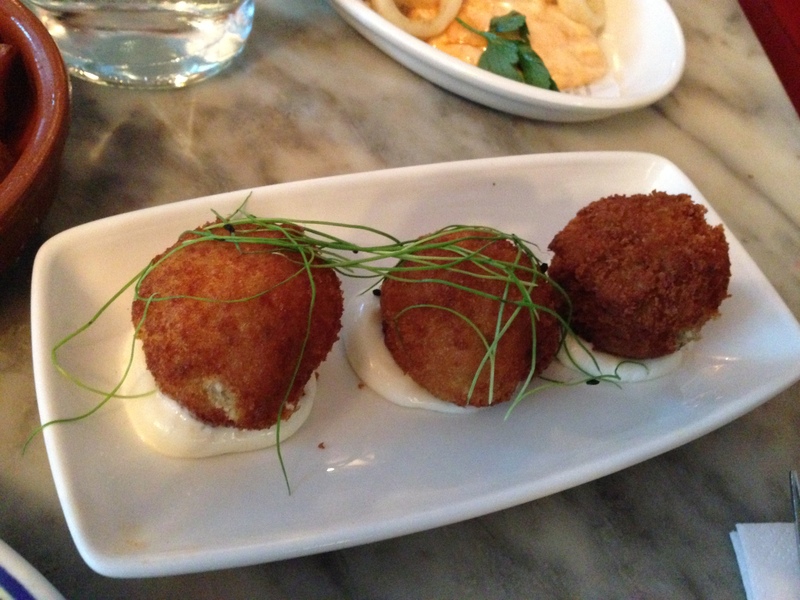 Overall, it was a decent tapas meal, but I would look elsewhere if you are searching for high quality tapas. Moving on from my mini-Spanish adventure, I knew before I left London I had to get some Indian food whether at was at a sit-down restaurant or getting my favorite Chicken Tikka footlong sandwich at Subway. Either way, I needed to get my curry in a hurry. 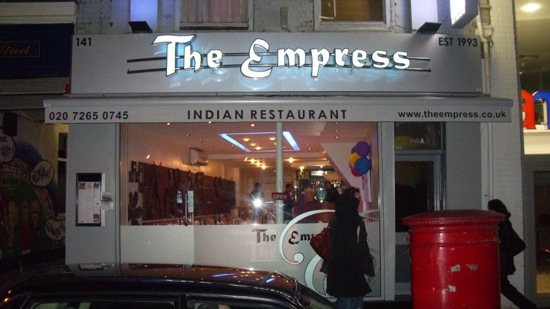 So, my friend Ravi set up our last meal together at The Empress located just a short walk from the Aldgate East tube station in the Tower Bridge area of London. 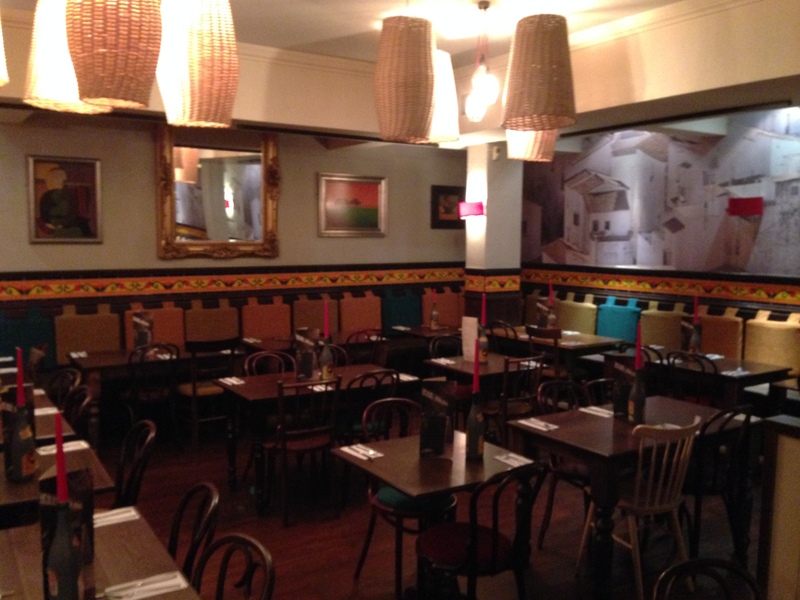 The interior was elegantly decorated but had very dim lighting. I don’t know if they were trying to save on their electricity bills or set the mood, but it made taking pictures of my food a bit harder along with walking through the restaurant in general. 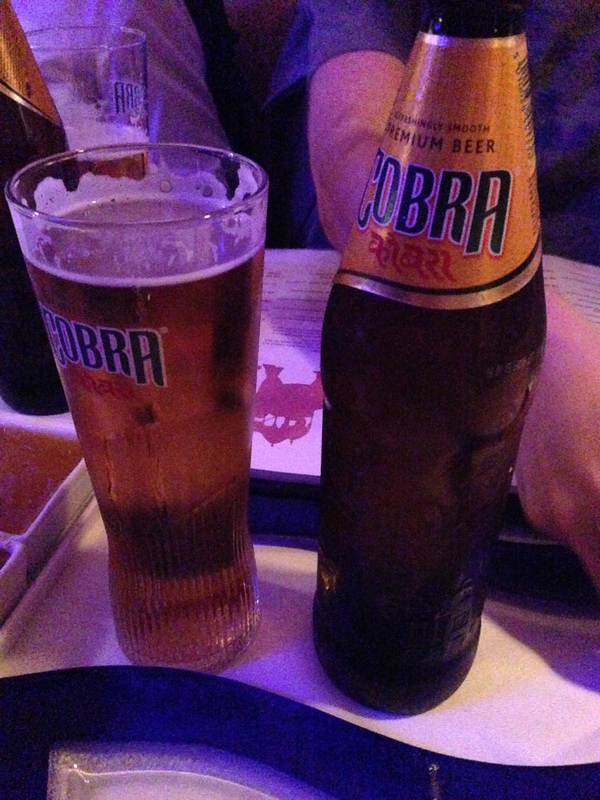 We started off with some Cobra beers (L 3.95) that are Indian in origin but brewed in the UK. It was a smooth lager that wasn’t terribly filling and had a light, slightly hoppy aftertaste. After wetting our whistles, we perused the menu to find that they had an extensive menu offering a plethora of Indian specialties from mild paneers to taste-bud scorching phals and everything in between. 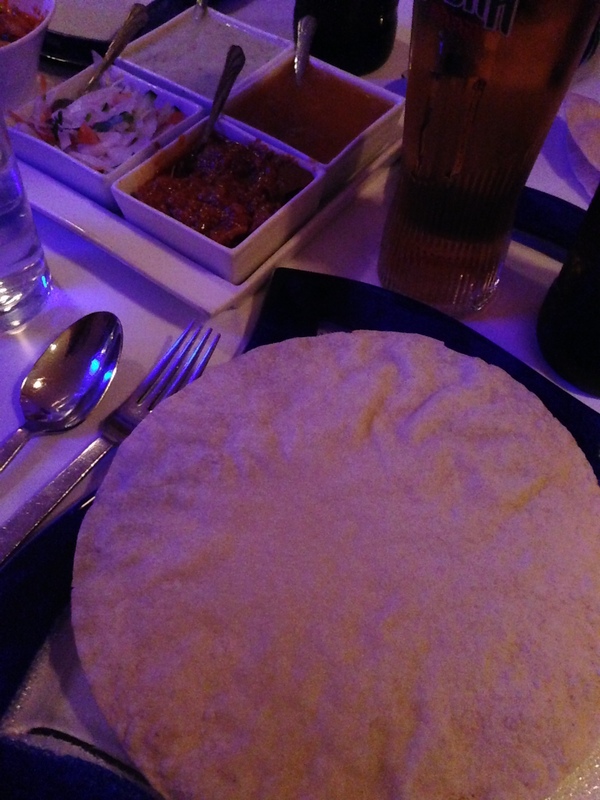 To start the feast, we got an order of papadum (Indian flatbread) that came with curry, chutney, yogurt, and pickled vegetables. The flatbread was crispy and somewhat bland until you put some of the garnishes on it. My personal favorite was the red chutney that packed a spicy punch. As for the entrees, we decided to split some smaller dishes like bindi (okra), aaloo mutter (potatoes and peas), raita (yogurt sauce) but also have our own meals. I was contemplating between the spicy vindaloo or the supposedly hellish phal, but the waiter dissuaded me from the latter saying that I’d only be tasting the spice. 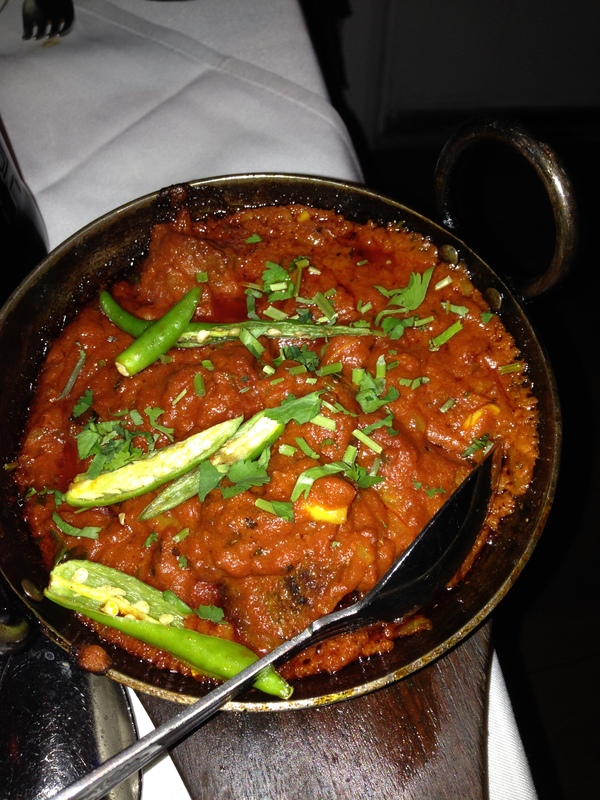 I don’t know if he did that because he thought I couldn’t handle it or was just being nice, but I went for the lamb vindaloo (L 11). All of our food came out at the same time along with some of the naan (flatbread) we ordered, and it looked and smelled delicious. The taste test would prove equally fruitful. My lamb vindaloo was filled with plenty of lamb swimming in the spiciest vindaloo sauce I’ve ever had, but it definitely brought plenty of delicious cumin and onion flavor with the flames. 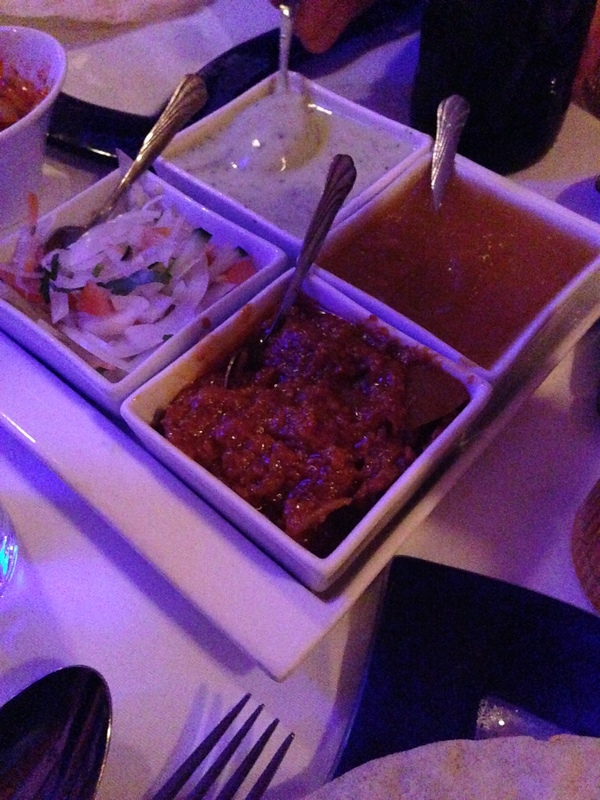 The raita cut through the inferno with a cool, cucumber splash coupled with some of the basmati rice we ordered. 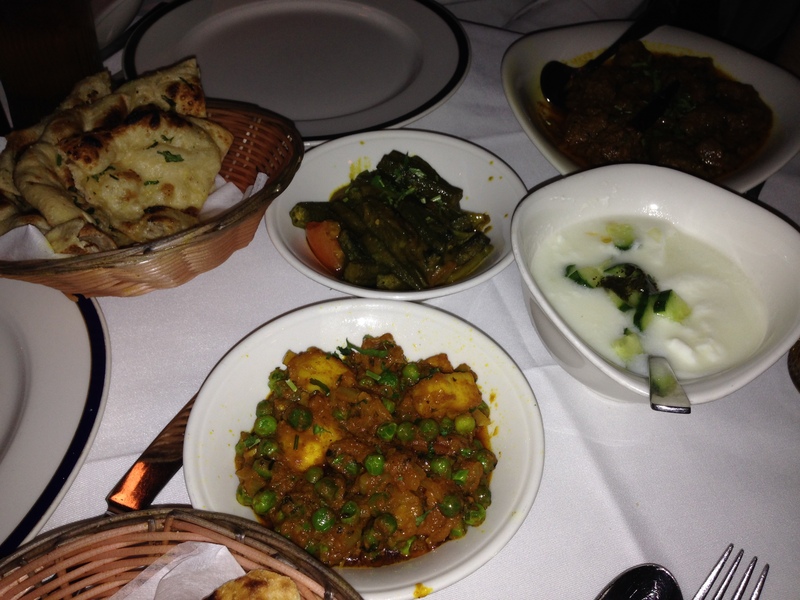 I really enjoyed the aaloo mutter as well since it was simple, hearty, not overly seasoned, and the peas weren’t soggy. I’d say it was the best Indian meal I’ve ever had for the price I paid, and I highly recommend you seek out The Empress. Even though we paid our check and got up to leave, the fun didn’t stop there. 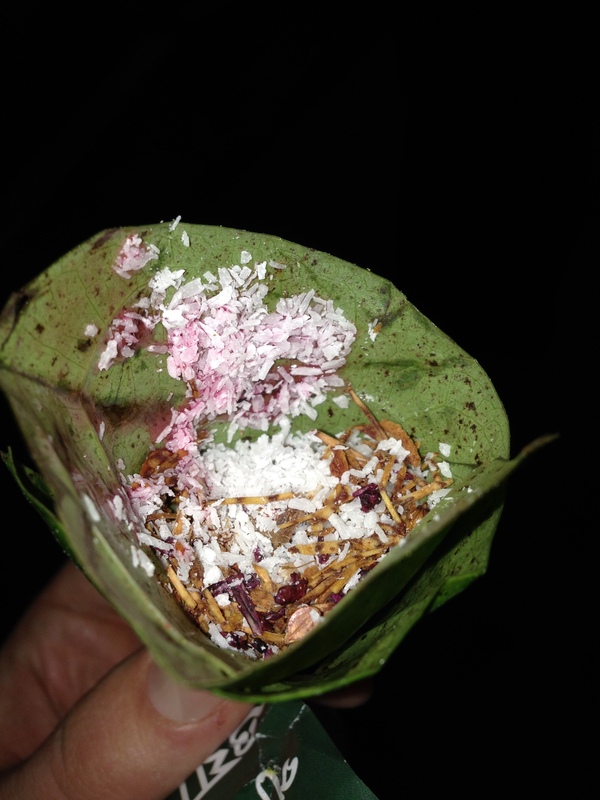 After dinner, one of our friends suggested that my friend Bob and I should try this Indian after dinner mint that helps with digestion called paan. 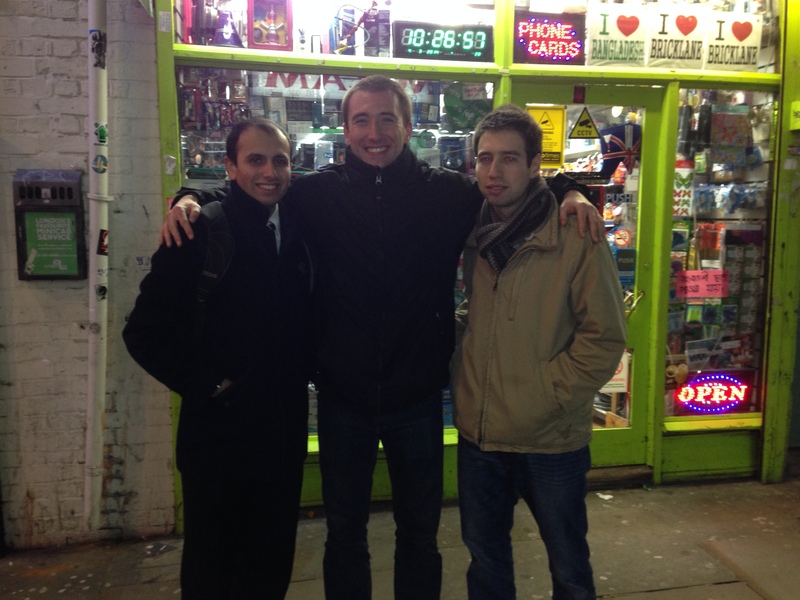 We walked further down the street to the world famous Brick Lane which is regarded as the hub of the best South Indian fare in the world. 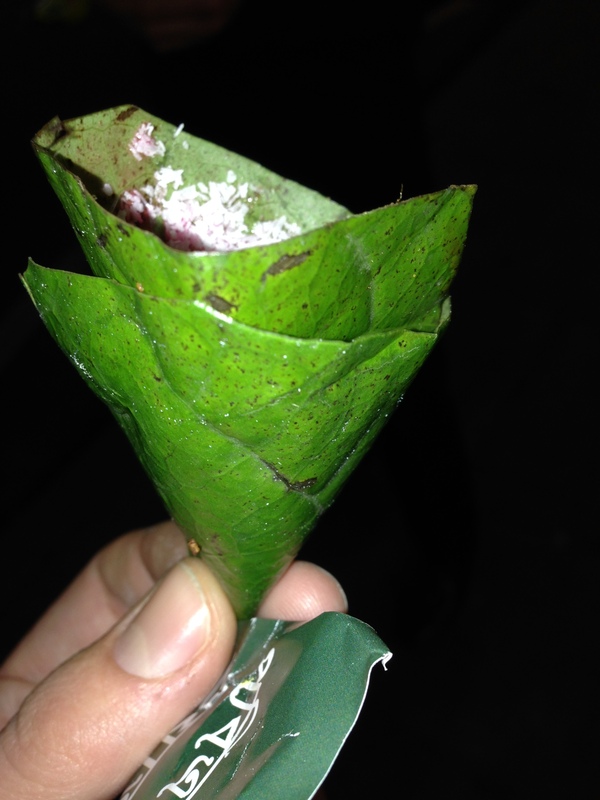 First, we walked into a respectable looking Indian bakery looking to see if they offered this paan treat, but the guy turned us away. Then, we moved 50 feet down the street to a convenience store selling everything from rolling tobacco to an unusual amount of calculators. I knew we were in the heart of a different community far from the glitz and glamour of more touristy spots as all of the workers referred to me as “boss” since I was the only person not of South Asian descent in the store. I saw the cashier take our order and proceeded to roll up what looked like a medium sized oval leaf into a cone. After scooping in something that looked like confetti and pouring some syrup inside along with rolling them up in newspapers, we walked back outside to finally try them. Bob and I took them out of the newspaper to find what seemed to be green cocoons that were packed tightly with that flaky material I saw that man stuff inside. While I was taking pictures of this mystery food, Bob popped his into his mouth, and I was frightened by his reaction. His face went quickly from a look of curiosity to a grimace to almost a portrait of pain as he subsequently ran to the nearest garbage can to spit it out.